The Mission of South Whitley Main Street is to be a unified team of community leaders dedicated to creating a vibrant quality of life for downtown South Whitley by preserving its past and celebrating its future. Building a strong community based on the core values of family, education, and economic growth. To contact South Whitley Main Street by email, send your message to southwhitleymainstreet@gmail.com. The Scholastic Art Contest in NE Indiana and NW Ohio was held in January. There were 3,068 entries from 200 regional schools. 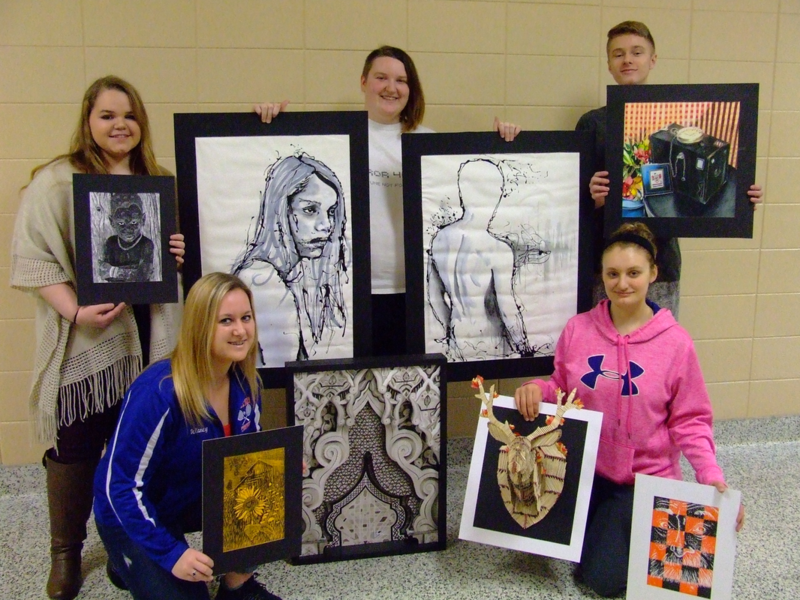 Whitko High School's outstanding art department had several students place during this competition. The group as a whole won 15 awards. The winning pieces are on display at IPFW Museum of Art from February to April. The SWMS board currently has two high school representatives who are active with projects, events and serve on committees. Both Maren Lehman and Ezra Miller are in their second year as volunteers for the Main Street organization. They are pictured here with the other classmates, displaying their award winning artwork. Maren is shown with her print "Old Man", which received an honorable mention and her "Smoking Hot Silver" sculpture won a "silver key." Ezra, a sophmore at WHS, proudly displays his "Still Life" drawing, which earned an honorable mention. Congratulations to all of the outstanding students at WHS. A special congratulations to Maren and Ezra on your accomplishments, We are happy you are a part of SW Main Street! !